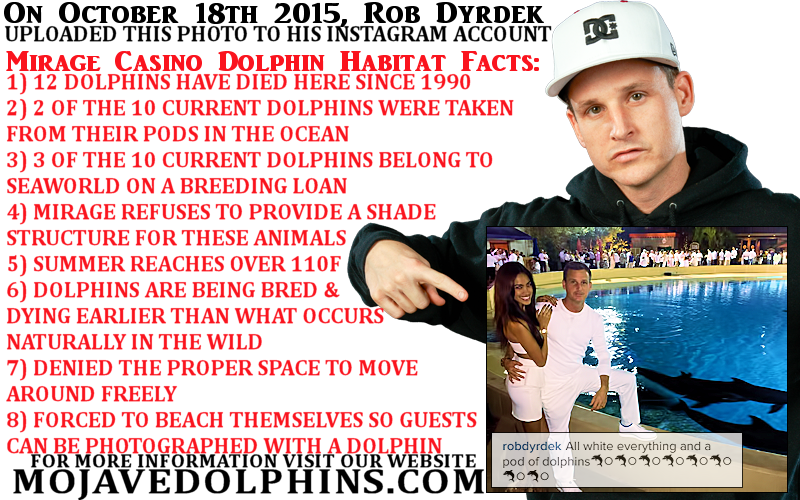 Over the weekend of October 17th-18th 2015, Rob Dyrdek uploaded a photo of what appears to be a private gathering at the Mirage Casino Dolphin Habitat after hours. 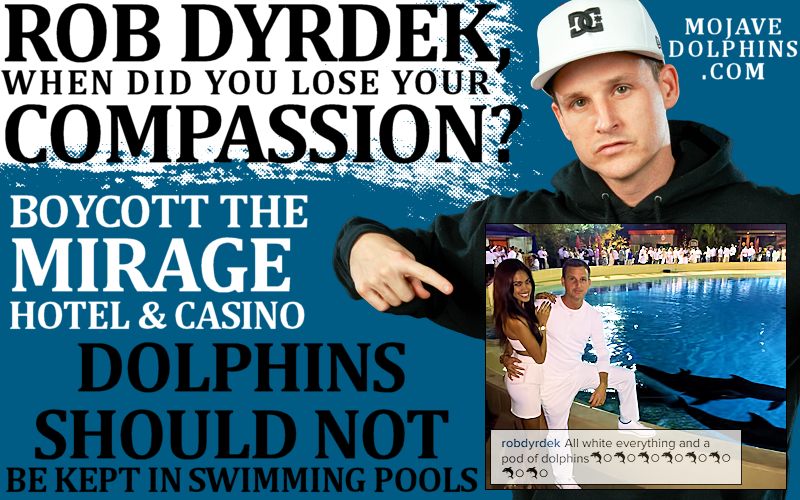 While activsts were out standing out on the strip, educating the tourists about the horrors of dolphin captivity, Rob was gushing about the attire of his guests and the “pod” of dolphins swimming in a small pool in the Mojave desert. These ten dolphins do not get any relief from extreme temperatures in the summer time. The UV rays burn their skin just like humans. Three of these dolphins belong to SeaWorld, who placed them in the desert hoping they would produce several offspring to further the captive gene pool. These dolphins are subjected to chewing gum in the pools, leaky tanks, left in a beached position for several minutes for photos, and gated away from their family members. We have noticed during the last 12 months that Viacom (the company that owns many television networks such as Comedy Central, MTV, Nickelodeon, LOGO, and Spike) has had several of their network stars directly promoting the dolphin habitat through their social media postings and indirectly through their promotional bookings and showings at the Terry Fator theater inside of the Mirage casino. While we understand that Rob and Bryiana Noelle Flores were recently married, and we are in no way trying to take away from their special day, we DO want to stress the importance of educating celebrities who choose to boast about such experiences while the animals are left to suffer. Rob and Bryiana are in a very fortunate place in life that has given them a platform to reach hundreds of thousands of people around the globe. We urge Bryiana and Rob to watch documentaries such as “Blackfish” and “The Cove”, research the effects of captivity on cetaceans, and ask themselves if they really believe that sentient mammals such as dolphins belong in barren swimming pools, hundreds of miles from the ocean in the middle of the driest desert in the country. 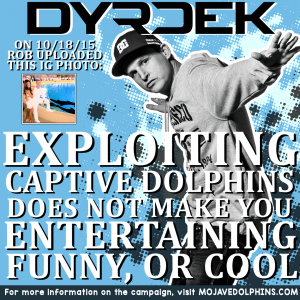 We ask that they speak to fellow celebrities such as Steve-o (who also received popularity thanks to MTV) and Joe Rogan and listen to their opinion on why they have joined the crusade against cetaceans in captivity.